Orthodox Church liturgical Oblation table vestments (green-gold) by Istok Church Supplies Corp. Welcome! You’ve landed on the page for best quality green-gold Oblation Table vestments at hard-to-beat prices! And with our made-to-measure services, you can confidently purchase a one-of-a-kind Oblation Table vestment that will help you celebrate the Divine Liturgy as it is meant to be celebrated – with tradition and spirituality. 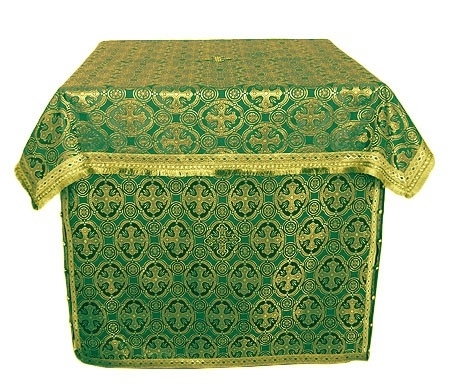 Green and gold is a traditional liturgical color combination that sets the right mood for the Divine Liturgy. We use only the best quality church silks and brocades for our green-gold Oblation Table vestments. Due to the online shopping model we follow, our prices are considerably lower than what you would find in high street Orthodox Christian stores. And really, nothing beats the variety of products we have on offer. Our green-gold Oblation Table vestments are designed to completely cover the Oblation Table, top to bottom. To enhance their appearance, we offer standard decoration free of cost. Customers have freedom to add premium decoration or velvet inserts to their order. We understand these vestments will be used frequently and need to be durable. Along with durability of the fabrics themselves, we also provide top quality workmanship to make these vestments must-have items for Orthodox Christian churches. The prices mentioned are for Oblation Table vestments of a specific size. As specialists for made-to-measure Orthodox Church vestments, we accept bespoke orders. Customers can make a request in the Notes field during check-out. All custom vestment orders are produced by our dedicated and trained tailors at our warehouse in Europe. Our team of tailors understand the traditions of Orthodox Christian church worship and pay close attention to details. We require a few weeks to complete a custom order, but we are confident customers will be pleased with the final results. With user-friendly browsing experience, easy ordering process and secure payment channels, we have been serving customers around the world. Come explore our fantastic collection of green-gold Oblation Table vestments!